Glucocorticoids exert anti-inflammatory and immunosuppressive activities by genomic and nongenomic effects. 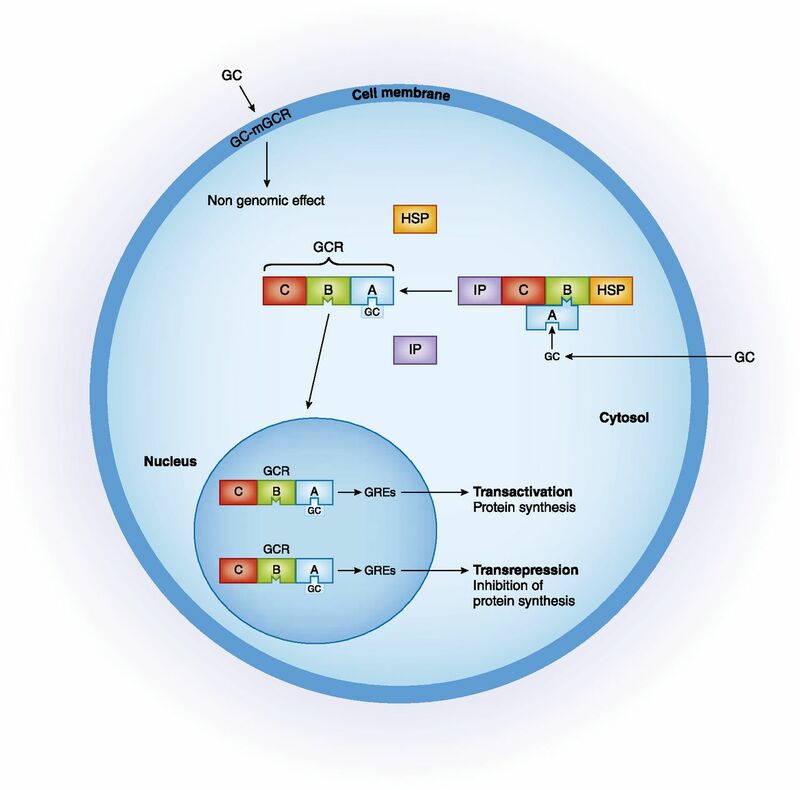 The classic genomic effects are mediated by cytosolic glucocorticoid receptors that can upregulate the expression of anti-inflammatory proteins in the nucleus (transactivation) or repress the translocation of proinflammatory transcription factors from the cytosol into the nucleus (transrepression). The nongenomic effects are probably mediated by membrane glucocorticoid receptors. Glucocorticoid receptors are expressed also in podocytes and experimental data suggest that glucocorticoids may protect from podocyte injury. Glucocorticoids have a low therapeutic index and may exert a number of time-dependent and dose-dependent side effects. Measures to prevent or attenuate side effects include single-morning administration of short-acting glucocorticoids, dietetic counseling, increasing physical activity, frequent monitoring, and adapting the doses to the clinical conditions of the patient. Synthetic glucocorticoids, either given alone or in combination with other immunosuppressive drugs, are still the cornerstone therapy in multiple glomerular disorders. However, glucocorticoids are of little benefit in C3 glomerulopathy and may be potentially deleterious in patients with maladaptive focal glomerulosclerosis. Their efficacy depends not only on the type and severity of glomerular disease, but also on the timeliness of administration, the dosage, and the duration of treatment. Whereas an excessive use of glucocorticoids can be responsible for severe toxicity, too low a dosage and too short duration of glucocorticoid treatment can result in false steroid resistance. Glucocorticoids have been extensively used in glomerular diseases. However, their indications for different subtypes of glomerular diseases are variable and in some instances their use may be inappropriate or even deleterious. This review focuses on important pharmacologic characteristics of glucocorticoids, potential side effects, and possible measures to prevent adverse events. The indications for glucocorticoids in treating different subtypes of glomerular diseases, and the possible flaws with their use, will be discussed. The naturally occurring glucocorticoid, cortisol, is released by adrenal glands, following a circadian rhythm regulated by the brain’s central pacemaker. Circulating levels are low at sleep onset, begin to increase between 2 and 4 am, peak a few minutes after awakening, and then decline through the day, reaching a nadir between eleven at night and one in the morning (1). As opposed to cortisol, synthetic glucocorticoids have longer half-lives because their hepatic metabolism is low. Glucocorticoids may be divided into short acting (prednisone, prednisolone, methylprednisolone, and deflazacort, with plasma half-lives of 60–200 minutes), intermediate acting (paramethasone and triamcinolone, with plasma half-lives of about 300 minutes), and long acting (dexamethasone and betamethasone, which suppress adrenocorticotrophic hormone levels for >48 hours). Glucocorticoids may exert their activities by two main mechanisms of action: the classic genomic effects and secondary nongenomic effects. The genomic effects develop with a time lag of 4–24 hours. These effects depend on the doses of synthetic glucocorticoids and on the density, availability, and affinity of glucocorticoid receptors. In the cytoplasm, glucocorticoids bind to a specific glucocorticoid receptor forming a complex that enters the nucleus. This complex binds to specific glucocorticoid response elements in genes and increases the expression of anti-inflammatory proteins (transactivation), or decreases the production of proinflammatory proteins (transrepression) (2,3) (Figure 1). It is believed that the adverse effects of glucocorticoids are induced by transactivation, whereas the beneficial anti-inflammatory effects are mainly due to transrepression. Although the molecular mechanisms of glucocorticoid-induced side effects are not completely understood, it is reasonable to assume that adverse events, such as steroid diabetes, require glucocorticoid receptor–DNA transactivation. In fact, transactivation increases the synthesis of phosphoenolpyruvate carboxykinase and glucose-6-phosphatase that are required for gluconeogenesis induced by glucocorticoids. Other adverse events of glucocorticoids (osteoporosis, skin atrophy, growth retardation, Cushing syndrome) are subject to complex regulation involving at least partially transactivation mechanisms (4). Accordingly, research for compounds that exert only transrepression is critical. However, because transactivation also plays an important anti-inflammatory role these compounds might lose clinical efficacy. Although this transrepression versus transactivation concept may be overly simplistic, it may allow for future development of selective glucocorticoid receptor agonists and modulators that might represent the basis for safer and more effective therapies. The anti-inflammatory and immunosuppressive activity of glucocorticoids is mediated primarily by genomic effects. In the cytoplasm the glucocorticoid actions are mediated by a specific receptor (glucocorticoid receptor [GCR]) which has two main isoforms, α and β. Isoform α is the main isoform and can mediate the genomic effects, whereas isoform β is unable to bind glucocorticoid. The nonactivated receptor is complexed with immunophilins (IP) and heat shock proteins (HSP). The glucocorticoid receptor has three exposed domains: the ligand-binding domain (domain A), the DNA-binding domain (domain B), and an immunogenic domain (domain C). Binding of glucocorticoid to domain A causes dissociation of immunophilin and HSP from the receptor. The newly formed complex glucocorticoid–glucocorticoid receptor (GC-GCR) undergoes an allosteric change that allows its translocation to the nucleus. Here, the new complex binds to specific glucocorticoid response elements (GREs) and this binding can either increase the production of anti-inflammatory genes (transactivation) or repress the activity of many important proinflammatory genes by binding to and inhibiting key transcription factors, like NF-κB and activator protein 1, that induce expression of many proinflammatory and vasodilating cytokines (transrepression). Nongenomic effects are mediated by plasma membrane glucocorticoid receptors (mGCR) or by nonspecific interaction with membrane-bound glucocorticoid receptors. There are two types of receptors: the classic glucocorticoid receptor α, that localizes in the plasma membrane, and the nonclassic receptor, with different pharmacologic characteristics. Nongenomic effects may prepare the cell for subsequent glucocorticoid-induced genomic changes, may bridge the gap between the early need of change and the delay in the expression of genomic effects, and may induce specific changes that in some instances are opposite to those induced by genomic effects. GC, glucocorticoid; mGCR, membrane glucocorticoid receptor. It is important to realize that intrinsic sensitivity to glucocorticoids varies among individuals. For instance, functional polymorphisms of the glucocorticoid receptor gene NR3C1 may be associated with either impaired or increased glucocorticoid sensitivity (5). Multidrug resistance–1 gene polymorphisms can also increase the susceptibility or resistance to glucocorticoids (6). The glucocorticoid receptor isoform α is the most abundant isoform and the primary mediator of glucocorticoid action. Instead, the isoform β inhibits the glucocorticoid activity. The unchecked expression of isoform β may lead to the formation of α/β heterodimers that decrease the sensitivity of target tissues to glucocorticoids. Nongenomic effects do not require protein synthesis and are characterized by rapid onset (seconds to minutes) and short duration of action (60–90 minutes). These effects are mediated by plasma membrane glucocorticoid receptors. There are two types of receptors. The classic glucocorticoid receptors, α, are cell surface receptors which rapidly alter cell signaling via modulation of intracellular signaling cascades (7). The nonclassic membrane glucocorticoid receptors are probably G protein–coupled receptors with poorly defined pharmacologic characteristics. Experimental studies suggest that glucocorticoids may protect podocytes from injury. Cultured podocytes express key components of the glucocorticoid receptor complex, including heat shock protein 90 and the immunophilins FKBP51 and FKBP52 (8). Either short-term high-dose or long-term low-dose dexamethasone treatment increased podocyte gene expression and induced phosphorylation and downregulation of the glucocorticoid receptor in isolated rat glomeruli (8). In human cultured podocytes, dexamethasone treatment for 24 hours increased the phosphorylation of nephrin through the serum- and glucocorticoid-regulated kinase 1 (9). In a murine model of focal glomerulosclerosis induced by cytotoxic antipodocyte antibody, prednisone reduced podocyte apoptosis and increased the number of podocyte progenitors (10). In rat podocytes and immortalized mouse podocytes stimulated by vasoactive factors, pretreatment with dexamethasone prevented podocyte motility and actin disassembly by modulating the production of cyclic guanosine monophosphate (11). These effects might explain the antiproteinuric effects of steroids. Glucocorticoids have a narrow therapeutic index and are responsible of a number of side effects. (Table 1) Side effects are usually dose-and time-dependent but may also be caused by inappropriate administration. Some measures may reduce the risk of adverse events. Patients on glucocorticoid therapy dosed multiple times a day exhibit a proinflammatory state and weakened immune defense. Switching to a once-daily administration reduces weight gain, normalizes the immune cell profile, and reduces infections (12). Proton pump inhibitors to minimize gastrointestinal side effects should be used with caution because their long-term use may rarely deteriorate kidney function and lead to magnesuria and osteoporosis (13). Psychotropic medications may be helpful in the management of individuals with psychiatric problems caused by glucocorticoids (14) (Table 2). Generalized glucocorticoid resistance is a rare familial or sporadic genetic condition characterized by target-tissue insensitivity to glucocorticoids, with compensatory elevations in circulating cortisol and adrenocorticotropic hormone concentrations that result in adrenal hyperplasia, and increased production of adrenal steroids with mineralocorticoid activity and/or androgenic activity. Partial steroid resistance may be caused by the hyperacetylation of heat shock protein 90 which is required for proper folding of the glucocorticoid receptor. This causes the glucocorticoid receptor to be defective in ligand binding with impaired nuclear translocation and transcriptional activation (15). Multidrug resistance–1 gene polymorphisms (6), low expression of glucocorticoid receptors (16), or high numbers of glucocorticoid receptor type β (7) may also cause steroid resistance (Table 3). Importantly, a number of patients are wrongly considered to be steroid resistant. Some steroid-sensitive patients do not respond to glucocorticoids because of an inadequate dosage of the drug. This mistake, which is often related to concerns about side effects, is made more frequently in children and older individuals. In other cases, the duration of steroid treatment is too short. For instance, the response to glucocorticoids may occur after months in adults with minimal change disease and in patients with FSGS. Furthermore, in patients with severe nephrotic syndrome with significant hypoalbuminemia, mucosal edema of the gastrointestinal tract may reduce the absorption of oral drugs. Patients taking anticonvulsants, rifampin, or other drugs that increase the activity of cytochrome P450 have an accelerated catabolism of glucocorticoids and may require higher doses. Glucocorticoids represent the drug of choice for initial treatment (Table 4) (17). Complete remission may be achieved in up to 90% of children and in 80%–85% of adults with prolonged treatment. Most steroid-resistant patients show underlying FSGS at repeated biopsy. In a few cases the poor response to glucocorticoids may be related to multidrug resistance–1 gene polymorphisms, low expression of glucocorticoid receptors, or high numbers of glucocorticoid receptor isoform type β (see above). In patients with frequent relapses or steroid-dependence, if there are no sign of glucocorticoid toxicity patients can be treated with glucocorticoids again. Nevertheless, frequent relapsers and steroid-dependent patients may develop signs of glucocorticoid toxicity and will require different therapies. Glucocorticoid-sparing strategies include a course of 2–3 months of cyclophosphamide, levamisole, mycophenolate (18), cyclosporine (19), or rituximab (20). This glomerular disease may be caused by an idiopathic disease or by genetic, toxic, viral, or maladaptive forms. Current evidence, mostly derived from retrospective analyses, favors prolonged glucocorticoid therapy (≥4–6 months) to induce remission (17). However, almost all of the monogenic forms of FSGS are steroid unresponsive. Calcineurin inhibitors, often administered with low-dose prednisone, may obtain a good rate of partial or complete remission (21). However, relapses are frequent after interruption of the drug. Glucocorticoids should not be administered to newborns with nephrotic syndrome or to subjects with maladaptive glomerular sclerosis. In children <1 year of age, the nephrotic syndrome is caused by polymorphisms or mutations of genes encoding podocyte proteins, such as nephrin, podocyn, NPHS3, and others. The only effective treatment for these children is kidney transplantation. Maladaptive glomerular sclerosis can be caused by a loss of nephrons due to kidney or systemic diseases, morbid obesity, or exposure to drugs, such as calcineurin inhibitors, intravenous bisphosphonates, and others. Glucocorticoid treatment in these patients may not be effective and may be deleterious. The outcome of patients with IgA nephropathy may be variable, with some patients remaining asymptomatic over time whereas up to 40%–50% of patients may progress to ESKD within 10–30 years. The most reliable factors that may predict progression are represented by proteinuria>1 g/d and hypertension (17). Renin-angiotensin system blockers may reduce proteinuria and BP and are generally considered to be the first therapeutic step in IgA nephropathy. For patients with eGFR>50 ml/min and proteinuria>1 g/d despite 6 months of renin-angiotensin system inhibitors, randomized controlled trials have demonstrated the benefits of a 6-month course of glucocorticoid therapy (22,23). A retrospective analysis of 1147 European patients with IgA nephropathy reported that glucocorticoid treatment was associated with significant reduction in proteinuria, slower rate of renal function decline, and better kidney survival (24). However, two studies warned against glucocorticoid use in IgA nephropathy, because of an increased risk of infections. In the Supportive Versus Immunosuppressive Therapy for the Treatment of Progressive IgA Nephropathy trial, participants with an eGFR≥60 ml/min per 1.73 m2 and proteinuria>0.75 g/d were randomized to supportive care or to treatment with glucocorticoids, whereas participants with eGFR<60 ml/min per 1.73 m2 received glucocorticoids plus cyclophosphamide for 3 months and azathioprine from month 4 to 36. Treated participants obtained a significant reduction of proteinuria in comparison with those given supportive care, but there was no effect on the decline of kidney function. Side effects, including death, were more serious with immunosuppressive therapy (25). The rate of kidney function decline was too low to appreciate a significant difference after a follow-up of 3 years. Moreover, the most severe adverse events were observed in patients with declining kidney function in whom cyclophosphamide and azathioprine were added to glucocorticoids. The Therapeutic Evaluation of Steroids in IgA Nephropathy Global trial assigned patients with eGFR between 20 and 120 ml/min per 1.73 m2 and proteinuria>1 g/d to symptomatic therapy or high-dose methylprednisolone (26). The study was discontinued after a median follow-up of 25 months because of an excess of infections in the methylprednisolone arm. At interruption, the primary end point (death, ESKD, deterioration of kidney function) was reached in 5.9% participants in the glucocorticoid arm versus 15.9% in the placebo arm (P=0.02). The decline in eGFR and the mean levels of daily proteinuria were significantly lower in participants given methylprednisolone. Importantly, participants randomized to treatment were given the same dosage of methylprednisolone independent of their kidney function. Moreover, some participants had been previously treated with immunosuppressive drugs and received no prophylaxis against Pneumocystis jirovecii. Patients with these characteristics are more susceptible to side effects of glucocorticoids and their inclusion in the study may have contributed to the high rate of side effects (27). Budesonide is a nonabsorbable steroid acting locally in the small intestine. It has a low oral bioavailability due to high first pass hepatic metabolism (28). A preliminary trial showed that a 9-month treatment with budesonide is effective in patients with IgA nephropathy (29). However, most patients who discontinued treatment experienced steroid-related adverse events. Long-term follow-up is needed to better appreciate the effectiveness and tolerance of budesonide. In summary, most studies indicate that glucocorticoids may lower the risk of kidney disease progression for IgA nephropathy. Meta-analyses have supported this conclusion (30,31). The main limiting issues are side effects of glucocorticoids. It is important to point out that administration of the same dosage of glucocorticoids to patients with impaired kidney function as that used in subjects with normal kidney function is a mistake that can increase the risk of severe side effects. In patients with low GFR the doses of glucocorticoids, either given orally or intravenously, should be reduced and patients should be closely monitored. The risk of toxicity may be further aggravated by the long-term administration of glucocorticoids with other immunosuppressive drugs, such as azathioprine that proved to be ineffective (32). Avoiding these pitfalls and following the recommendations reported above can substantially reduce toxicity while preserving effectiveness of glucocorticoids in IgA nephropathy. There is agreement that immunosuppressive treatment of membranous nephropathy should be limited to patients with idiopathic disease and nephrotic syndrome or progressive disease. A systematic review of therapeutic studies in idiopathic membranous nephropathy demonstrated that glucocorticoids did not improve either the probability of entering complete remission of proteinuria or the actuarial kidney survival at 5 years (33). Although the use of glucocorticoids alone is ineffective, glucocorticoids in combination with other immunosuppressive drugs may exert synergistic or additive effects. Two long-term randomized trials showed that alternating glucocorticoids with an alkylating agent every other month for 6 months significantly improved the chances of remission and preserved kidney function at 10 years (34,35). Good results have also been reported with a combination of glucocorticoids with mycophenolate mofetil, but most patients relapsed when treatment was interrupted (36). In summary, treatments on the basis of glucocorticoids alone should be avoided in membranous nephropathy. When using glucocorticoids with an alkylating agent, it is recommended to alternate the two drugs every other month, thus allowing a period of wash-out of either drug. This strategy may reduce side effects, whereas a simultaneous combination of steroids and cytotoxic agents can increase toxicity. Other successful strategies that allow reduction of the doses of steroids and avoidance of alkylating agents include the use of cyclosporine with low-dose glucocorticoids (19), tacrolimus (37), and rituximab (38). Membranoproliferative GN is a pattern of injury, not a specific disease. A new classification of this histologic pattern on the basis of immunofluorescence microscopy has been proposed by Sethi and Fervenza (39). The membranoproliferative lesion may be classified as an immune complex–mediated disorder or complement-mediated disorder. In most cases, immune complex–mediated disorders are secondary to chronic infections, autoimmune diseases, thrombotic microangiopathy, malignancy, or monoclonal gammopathy. A consensus conference proposed to use the term C3 glomerulopathy to describe glomerular lesions in which there is glomerular accumulation of C3 with little or no Ig. On the basis of electron microscopy features, C3 glomerulopathy may be subdivided into dense deposit disease (ribbon-like intramembranous electron-dense deposits) and C3 GN (mesangial and subendothelial, subepithelial, or intramembranous electron-dense deposits, with fraying of lamina densa) (40). There is no evidence that glucocorticoid monotherapy may be effective in dense deposit disease. In C3 GN a prolonged treatment with glucocorticoids is unlikely to be of benefit and may be associated with serious adverse events. Better results may be obtained by combining glucocorticoids with mycophenolate mofetil (41). In C3 glomerulopathy encouraging results have been reported with eculizumab, an anti-C5 mAb (42). This is the most common form of crescentic GN, accounting for around 60%–80% of all cases. A consensus conference proposed reclassification of crescentic GN as anti–neutrophil cytoplasmic autoantibody–associated vasculitis (43). However, some patients with pauci-immune crescentic GN lack anti–neutrophil cytoplasmic autoantibody (44). The natural course of crescentic GN is ominous and usually leads to ESKD, whereas appropriate treatment may halt the progression and may even achieve a complete remission. Many practitioners (and a number of nephrologists) wait to start treatment until a firm diagnosis is made. This is a mistake that puts the patient at risk of irreversible kidney lesions and life-threatening complications. Any patient presenting with a nephritic syndrome and a rapidly progressive course should start immediate treatment with intravenous high-dose methylprednisolone pulses (45). In the meantime, immunologic investigations and a kidney biopsy should be done to establish the cause. Once a complete diagnosis has been ascertained, a specific treatment can be initiated. Cyclophosphamide or rituximab, with or without plasmapheresis, may be added unless there are contraindications such as advanced age or severe comorbidity. Eculizumab may be considered if there is evidence of severe activation of the complement cascade (46). Oral prednisone, progressively tapered, together with azathioprine or mycophenolate is used for maintenance. Glucocorticoids are used in all forms of lupus nephritis. Whenever an aggressive treatment is needed, as in the case of induction therapy and management of flares, intravenous high-dose methylprednisolone pulses (0.5–1.0 g each) are frequently used, often in association with cyclophosphamide, administered orally or intravenously, or mycophenolate mofetil, or rituximab (47). Infusions of high-dose methylprednisolone may be complicated by infection or cardiac arrhythmias. To prevent infections, many centers do not exceed three pulse administrations, either given every day or every other day. To prevent cardiac events associated with high-dose methylprednisolone, serum potassium should be checked before infusion; methylprednisolone should be infused in a peripheral vein over 30–60 minutes, rather than rapid injection of the drug using a central vein; and patients with cardiac problems should be monitored during infusion. For maintenance therapy for this condition, glucocorticoids remain the cornerstone. Steroid-sparing strategies have been proposed for maintenance therapy in patients with lupus nephritis, including oral or intravenous cyclophosphamide (48), mycophenolate (49), azathioprine (50), and/or calcineurin inhibitors (50,51). Although glucocorticoids are clearly associated with side effects, their use is critical in a number of glomerular diseases. Avoiding improper indications and inappropriate administration may increase the benefit/risk ratio for these indispensable drugs. C.P. was a member of the steering committee of the Italian IgA study. F.L. reported consulting on IgA nephropathy for Pharmalink and was a member of the steering committee of the targeted-release budesonide versus placebo in patients with IgA nephropathy study and the Italian IgA study.